ziftrCOIN™ | What is ziftrCOIN? 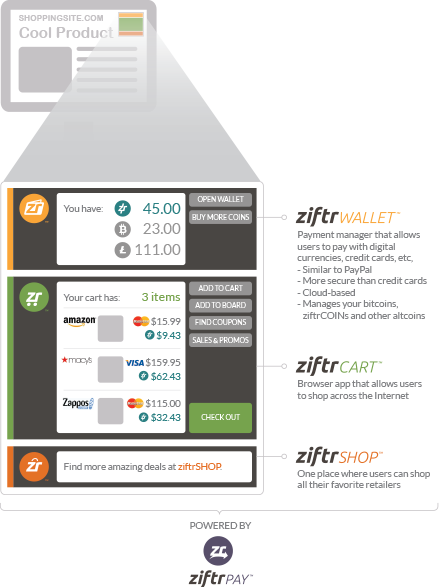 ziftrCOIN, the gateway coin to mainstream cryptocurrency adoption, is a new altcoin created by Ziftr, an ecommerce company that develops tools and applications to revolutionize shopping. To revolutionize shopping by putting cryptocurrency into the hands of consumers and enabling them to conduct simple, secure transactions at their favorite retailers. Retailers are wary of accepting cryptocurrency because most of the current APIs only work with one specific coin. With the cryptocurrency market constantly evolving, they don’t want to waste time and resources integrating a complex yet limiting API. Ziftr gives retailers of all sizes the opportunity to become a Ziftr Retailer, through which they gain access to Ziftr’s innovative applications. These include ziftrPAY, a highly secure API that enables retailers to accept ziftrCOIN, Bitcoin and numerous altcoins in addition to credit card payments, and ziftrSHOP, an online marketplace that helps retailers increase their online visibility. Consumers don’t feel confident using cryptocurrency as a form of payment due to the distinct lack of consumer-friendly technology surrounding its use. Essentially, they don’t now how to get coins and they don’t know where to spend them. ziftrCOIN is giving away 300 million coins to help consumers become familiar with cryptocurrency. Each ziftrCOIN will have a minimum redemption value of $1 when spent within the ziftrSHOP online marketplace, where Ziftr’s innovative shopping cart technology, ziftrCART, provides a user-friendly way for consumers to conduct transactions using cryptocurrency and credit cards. Think of ziftrCOINs as your very own Ziftr coupons. By establishing ziftrCOIN as a gateway coin for consumers and giving retailers the opportunity to become a Ziftr Retailer so they can accept major cryptocurrencies, ziftrCOIN is ultimately fueling the success of the entire cryptocurrency market. Stay up-to-date on the latest news on cryptocurrency and ziftrCOIN. Interact directly with the ziftrCOIN software engineers. Get the inside scoop on ziftrCOIN news and developments. Subscribe to our newsletter and we'll bring the information to you. Questions? Comments? Click here to send an email directly to the ziftrCOIN team.